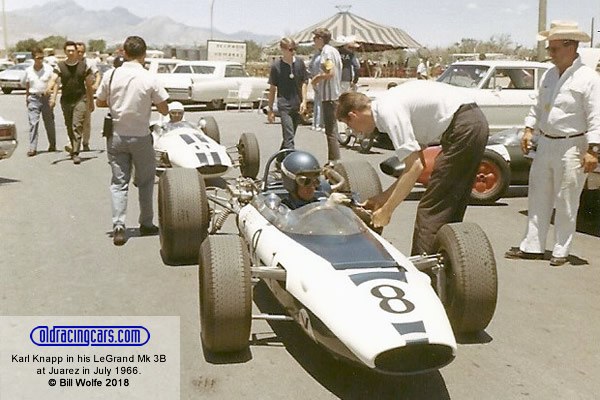 The second season of Formula B saw fields slowly increase but the only serious competition was in Northeast Division and between the handful of competitive runners in California, led by Karl Knapp and Lou Sell in LeGrand Mk 3Bs. Stew McMillen had a competitive car in Indianapolis Region but no real local competition, as did Hank Candler in Colorado. At the Runoffs at Riverside, Lou Sell started from pole in his LeGrand with his fellow South Pacific LeGrand pedallers fifth and sixth. Amongst them were Don Morin's newly-acquired Brabham BT18, Ed Marshall's Gamboa Alexis and McMillen's Brabham. The race would be keenly watched by anyone planning to compete in the new Continental Championship in 1967 and as LeGrands fell by the wayside, Morin won for Brabham with more of the English cars third, fourth and fifth. Brabham would build a series of Formula B cars for 1967, the BT21A, and Fred Opert was now assured of good sales. The tables are taken from the SCCA's Sports Car magazine November and December 1966. Any data in brackets, such as model names, has been added based on other research.